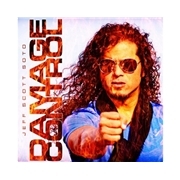 Veteran JEFF SCOTT SOTO started out in the 80´s as a member of YNGWIE MALMSTEEN`s ever changing band, continued with the likes of EYES, TALISMAN, later on SOUL SIRKUS and since 1994 he´s been doing solo albums. The last few of them has been so soft they´ve been bordering on elevator music, or funk. For this his twelfth album all in all he seems to have injected the rock back into his output. Celebrity guests included Dave Meniketti of Y&T, Jamie Borger of TALISMAN/TREAT and Joel Hoekstra of NIGHT RANGER. He still has it, that is for sure. I´ve seen him live on some occasions and he has gone more and more in the direction of funk. But here is Jeff back in the rock. Opener “Give a Little More” has a soft touch to the rockier style, not the most exciting cut to open with. The title track has more power in it, the refrain is great and the joy of playing is discernible. The best cuts are “Look Inside Your Heart” and “AfterWorld”, the latter even includes some funkiness without disappointing. The rest is mostly far over par, with the exception of the soft ballad with a stolen feel, “Bonafide”. For the closer “NeverEnding War” he uses a helicopter intro with a child´s voice thrown in. The song has a clear message, in difference to the rest. The feel-good hard rock style of Jeff´s past might still have a place in his heart, it sure has one in mine.